ok i have a question, i have a built h.o motor, im using the timing chain housing from a 95 which has the fitting on it that goes to the a/o seperator, but im also using the timing chain cover from an older quad that has the tube coming out of it that goes to the a/o sep, right now i have the whole in the housing closed off, but what im wondering is could i leave all the stock pcv parts in place, and just run a line from the port on the timing chain housing, to a catch can then to the intake pipe for my turbo. would this solve the problem or at least help? the catch can would still see vacuum and it would be venting the housing right ? [*] so many pages....sorta like the above, but unboosted. Do you think I could run from the timing cover(pressure area, not at valve cover fresh air port), to a catch can with a breather? I really don't want to route this back into the intake or valve cover. Experiment to see if it will stop carbon and "sludge" build-up. Which car and motor? Your profile shows 2 cars. sorry! I havent updated the vehicles since i joined, i think. even as a na LD9, put the catch can between the oil/air seperator on the block and the inlet on the intake. This should keep you from getting stuff in the intake. Well, what about hooking it the way I suggested. Will it work? how can I delete the oil/ air separator? Just make a flat piece of steel plate and bolt it in place of the o/a separator? why do you want to delete the oil/air seperator? Why not use the system the way it was designed? Doing it either way will not prevent carbon build up. Do it as I stated earlier it will prevent oil vapor from going back in the intake (as long as you get a real catch can). I am wokdering this as well. I am wondering if you cant delete the oil/air separator. I was thinking about doing so and taking the hose off the timing chain cover and venting this to a catch can with a breather. Since this is just an experiment for now before I setup a couple other cars this way, I bought one of those $20 ebay canisters with the nylon level indicator on the side. I'm going to fish some brillo pad in there before i install it. As for why I want to delete the oil separator; it stems from reading some posts. Amazing how the A/O is just a baffle system, but it seems to block up and cause oil consumption, so why leave it in the mix...? I'll be running mobil1 synthetic, unless there is a cheaper synthetic like Castrol or something. Cost effective just because I put @3000mi on a month to month and a half. It really shouldn't blacken or sluge up if changed every 3-5k, but I'm trying to prevent just the same. My uncle's 90(?) protege has @350k miles on it and taking the valve cover off is an amazing surprise. The inside of the car is filthy, the inside of the engine-spotless! I gotta say, that made me a believer in the synthetic. And Mark, yeah, same setup I'm lookin at. I figure, why put the crap back into the engine. Brand new factory pcv systems get build-up. I atone that to mostly going from valve to intake, but in my eyes, even with a catch can, the "vapors" will still have oil in it, so eventually you'll still have the same regurgitated gunk going back in through the intake line. So, if the line from the cover is crankcase pressure, you don't need the vacuum side. The vacuum side was strictly for emissions purposes and maybe a small argument for fuel economy. On that note, gunked up engines do not have good fuel economy. The oil consumption you speak of should go awy with a catch can doing it the stock way. I have been running a cheap eBay catch can for a good 4-5 years and it has had no oil build up in the intake , and oil consumption dropped. You will get a decent amount of oil coming out of the timing chain housing, so I could see more oil consumption if you delete the oil/air separator. If you leave it in you allow the oil another chance to get back to where it belongs, but yes some will still get past the oil/air separator, but not as much as coming out of the timing chain housing. But what I'm confused about is why the red section is needed. The check valve in the red line makes it only work when the manifold is in vacuum and is necessary to keep from boosting the PCV system but the green is always in vacuum even if your in boost so I am failing to see why two sources are needed especially when one only works part time. I understand there is a port in the stock manifold that goes directly into the #3 port and the HO manifold blocks it but why do we have this urge/need to keep two vacuum sources for the system? On the other hand, the A/O then can then intake is the way that seems to make more sense other than if the A/O fails. The thing I dont like about the eBay can, is the in/out ports are side by side on the top. would be better farther apart on can and maybe a divided wall in between. yes, easy answer, "spend more $" LOL. I think I'm going to get the engine done. Then install the can with a mix of our ideas. I'll leave the A/O in, then the can, then a breather(no line to intake) and see how that goes. Would be cool to have the space to make the drain the return back into the block instead of the A/O. the A/O can't really go bad. Have you looked at it? It is a very simple part. Unless broken (which would only happen during install or maybe a wreck). Currently no I have nothing else inside my catch can. I want to get a better one. Amazing, 3 years later and people still don't understand the basics behind the above system. Change it up all you'd like - it's your car. You're definitely complicating something extremely simple. I'll give you one tip though - do you honestly think the turbo intake at idle has more vacuum going through it than the manifold itself? Or even at partial throttle? Do you really think oil will make it through the air oil separator AND a baffled catch can? Do what you like - this was simply a guide to help people. This system managed to help three turbo LD9's at 18-22 psi completely stop losing oil, so I'm pretty satisfied in how it works. Also bear in mind you are looking at an edited image of the original design which is lacking a check valve. The original design is more complicated - that one is simplified. 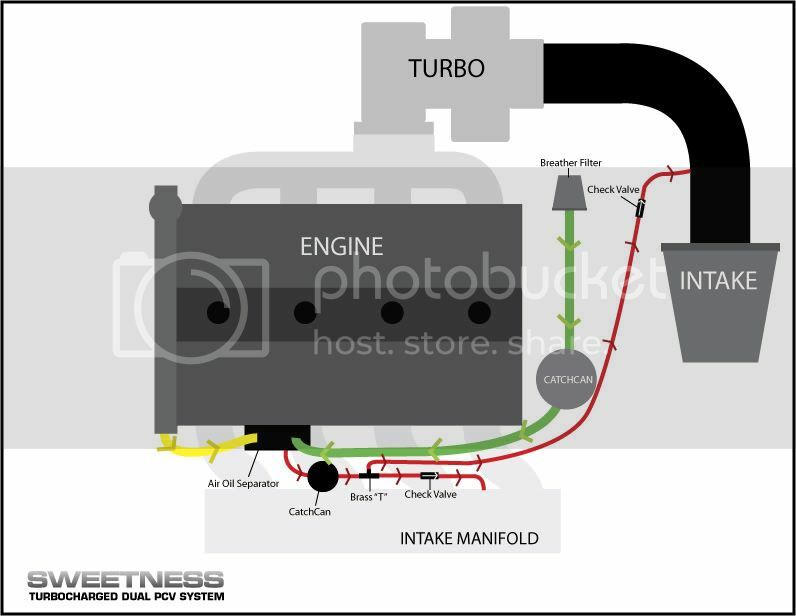 Regardless the point is the manifold is under FAR more vacuum at idle/part throttle than the turbo intake. This is how the GMSC system works with its bypass valve area. Ever notice that IT has two PCV lines? One before the TB and one on the supercharger? I have not seen a GMSC kit, didn't know they ran it like that. I don't know if the "difficult" statement was directed toward me or not, but I'm not trying to make it difficult. I'm simply trying to promote different ways of thinking and installing this setup. What baffles me is that all I read is how the A/O has gone bad, but in my 15yrs as a tech, I've never seen one go bad. Just figured it could be taken out of the equation. where have you read it has gone bad? I have never heard of it. I have heard of them getting clogged, which I good catch can setup would likely resolve that issue (after cleaning it out). 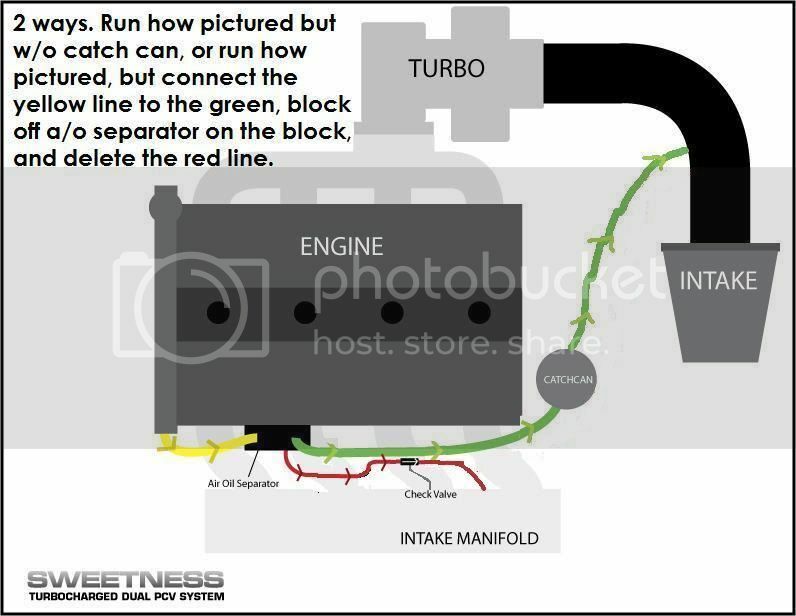 Because my intake manifold has no PCV port this is how I am going to run my system. From the timing chain cover I am going to a catch can, my A/O Sep I am blocking off besides one port. From there the other side will go to the catch can as well. From the catch can I will run a line to the intake manifold. Pretty simple. And dont worry, I agree; it's a cleanable baffle, but some don't get that. My deal is why leave it in the mix when you can just block it off. I guess for me, since this is a DD and mine is always the last to be worked on; it would be nice to not have to find the time to remove an intake to clean this. I still have oil leaking from the cam tower gaskets (and at least one bolt head area)... if I take the oil cap off, you can feel the pulsing air from the crankcase still while the engine is idling. I just cleaned out the PCV baffle and all hoses... so no blockages whatsoever.. The red line in the image directly above this post, doesn't that cause a vacuum leak? The intake manifold is sucking in air from the PCV baffle, but the PCV baffle isn't a sealed unit, it's vented via the green line, so unmetered air can enter the intake manifold. Especially if the pressure from the crankcase is making its way into the manifold (the intent). I suppose the stock PCV setup does the same thing with the port through the head/block that leads to the PCV baffle as well though and apparently there's no issue. I still have the same problem with excess crankcase pressure causing oil leaks anywhere it can. Quart a week. Haven't had the chance to take off my timing cover and punch a few large holes and run hoses from them to vent better.. annoying.